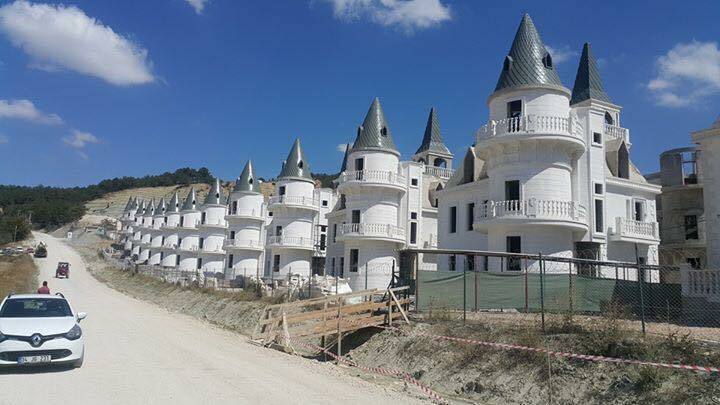 IF YOU’RE LOOKING for a chateau (and who isn’t these days? ), have I got a deal for you! Or, at least, details of a potential deal. The chateaux of Burj Al Babas. Image from CNN Travel, January 25, 2019. 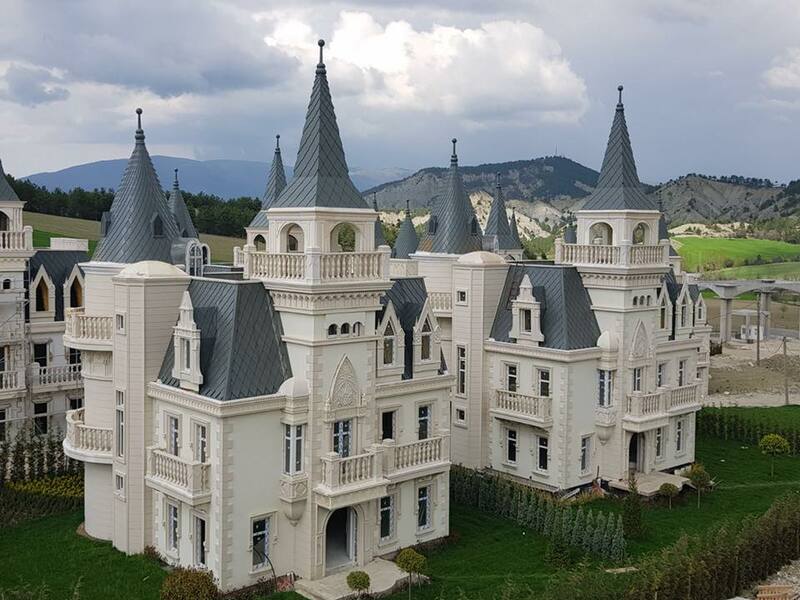 Burj Al Babas was to be a luxury housing development near the town of Mudurnu, in northwest Turkey, about halfway between Ankara, the country’s capital, and Istanbul. 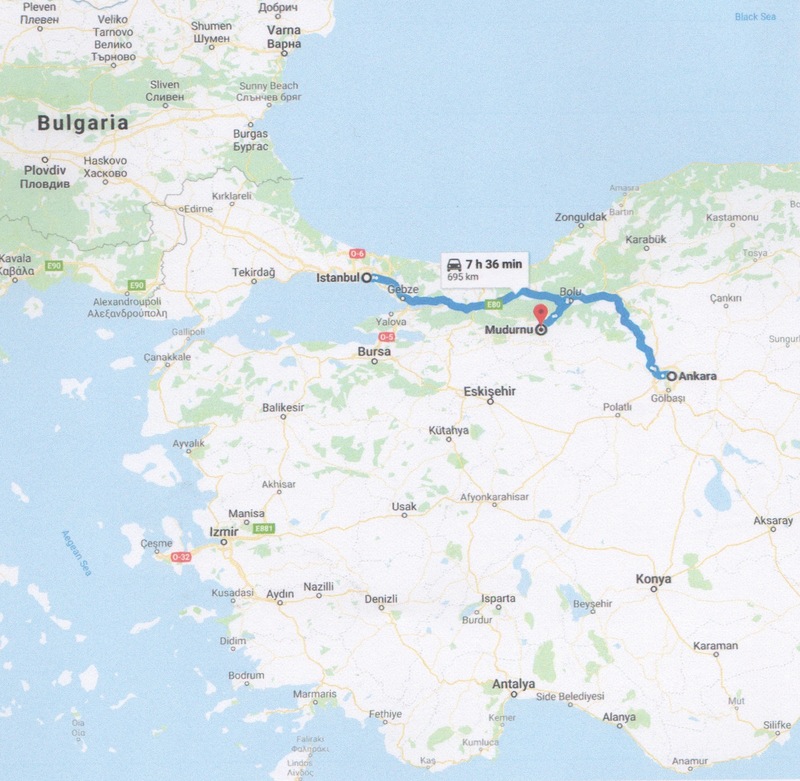 Figure perhaps a 3 1/2–4 hours’ drive to Burj Al Babas from either Ankara or Istanbul. Image from Google Maps. Begun in 2014, Burj Al Babas was to have 732 chateaux reportedly selling for $400,000 to $500,000 a piece. According to the Burj Al Babas website, the luxurious development would feature a large domed communal center, with shops, cinemas, restaurants, conference halls, meeting rooms, and a nursery. Other Burj Al Babas amenities would include Turkish baths, saunas, steam rooms, an aqua park, basketball courts, tennis courts, and football pitches. This and the following image from Bloomberg. What with one thing and another, the developers Sarot Property Group got into recession-fueled financial difficulty in 2018. 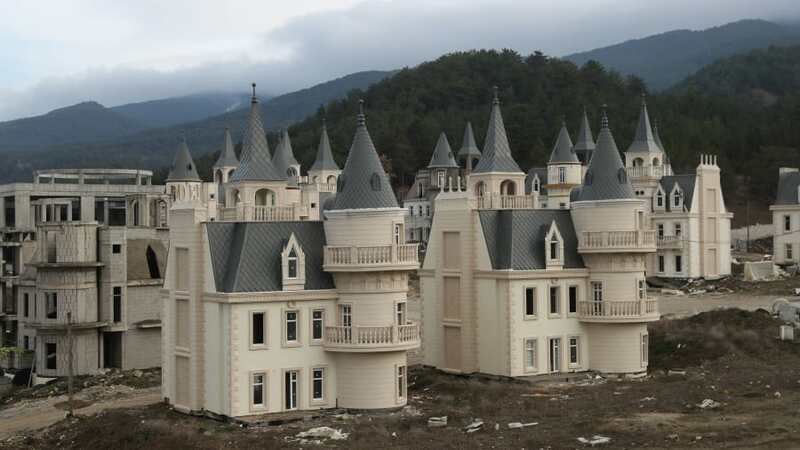 Some of the chateaux had been sold, but many investors pulled out, and Burj Al Babas was abandoned. The website de zeen offers a drone tour of Burj Al Babas. 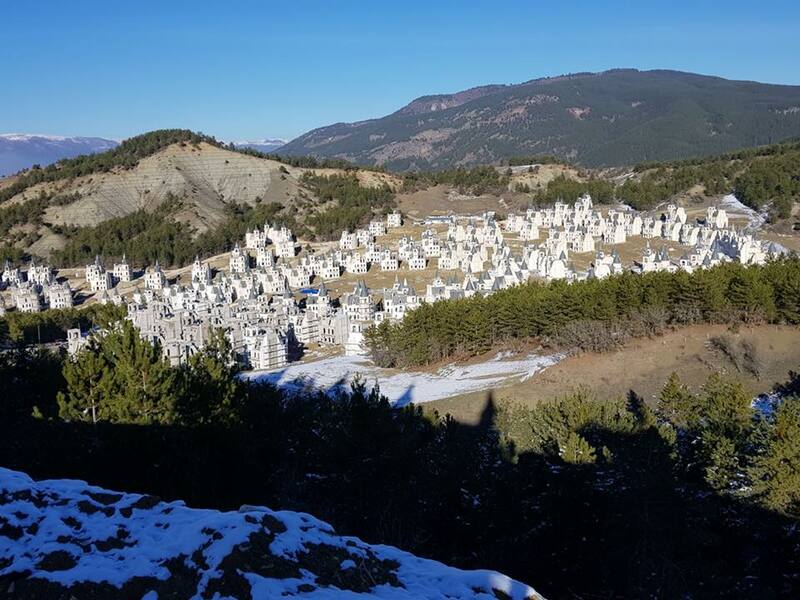 A view of Burj Al Babas nestled in the picturesque mountains of Bolu Province, Turkey. Image from Bloomberg. Wouldn’t, by definition, ALL the baths be Turkish? That could be a real selling point! My company has been working in Turkey since 2007. I started traveling there privately starting around 2000. Beautiful country. Very nice people in general. I saw lots of big new blocks of gov’t subsidized flats during my first business trips there. The economy was booming and had been for a while. This development looks like a logical extension of that trend, and the eventual bust when the economy cools off. 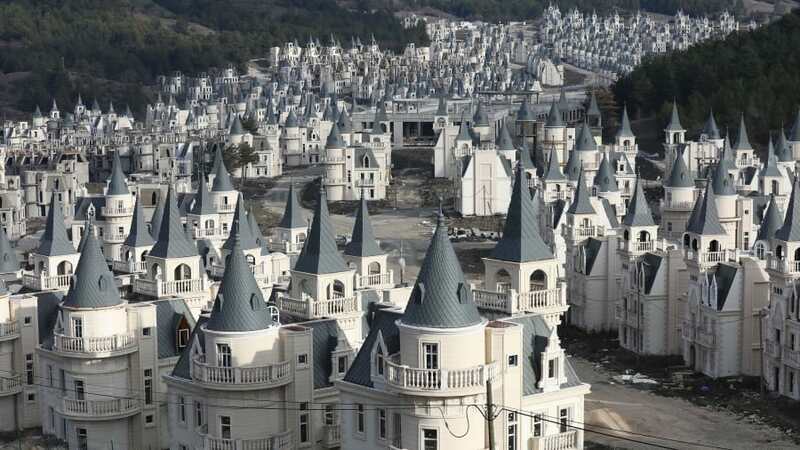 It would be interesting to know who the builder thought was going to buy all those houses. That’s a lot of money for a house, meaning a lot of concentrated wealth somewhere relatively nearby – as no one is going to commute to Istanbul or Ankara from there, and it’s pretty far for a weekend getaway as well. Interesting! While this certainly appears to have been a very high end development, I am always shocked when I see so many virtually identical structures right down to the same design, color, and roofing material. 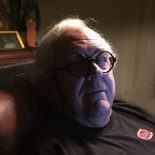 While I am not a drinking man, I have bad dreams about coming home late one night, tired, and perhaps a bit tipped over, and walking into the wrong house. It would be a potential problem if there were just a dozen or so identical units, but will close to 600, well it would be enough to drive you to drink! Agreed. This is what caught my eye in learning of Burj Al Babas. This looks more like a toy-city than beeing meant sereously 😉 . 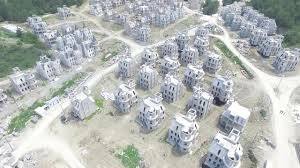 This entry was posted on February 1, 2019 by simanaitissays in Just Trippin' and tagged "Burj Al Babas: Turkey's Abandoned Ghost Town" Francesca Street "CNN Travel", "Drone Footage Reveals Abandoned Turkish Chateaux" Tom Ravenscroft "de zeen", "Housing project in Turkey's north targeted rich Arab clients" Cagan Koc "Bloomberg", Burj Al Babas Chateaux development in Turkey, Mudurnu Turkey midway between Ankara and Istanbul.